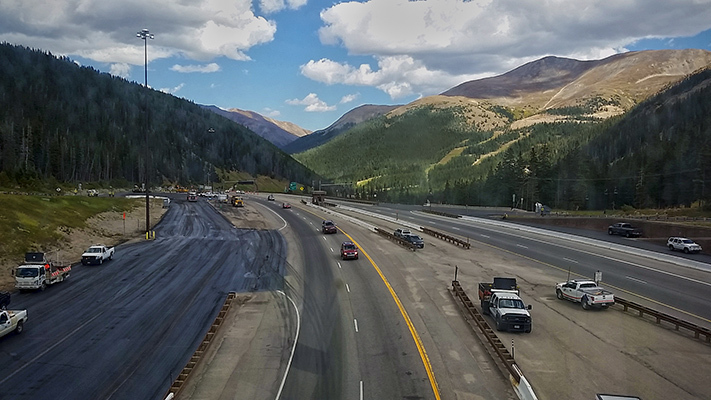 LS Gallegos, as prime consultant, provided Construction Management, Contract Administration, Inspection, and Materials Testing Services to the Colorado Department of Transportation over a two and a half-year period. This Interstate Highway Resurfacing and Bridge Joint Replacement project involved removal and replacement of expansion joints for 14 bridges and roto-milling approximately 300,000 square yards of pavement surface and replacing it with approximately 36,000 tons of new asphalt pavement in Clear Creek, Summit, and Eagle counties, Colorado. This project included bridge joint replacement and mainline pavement as well as paving inside both bores of the Eisenhower/Johnson Memorial tunnels. It also included paving parking areas at both ends of the tunnels, guardrail replacement, culvert lining, and ramp metering.